The news in recent days has been dominated by searing images of children held in cages at border facilities, as well as audio recordings of young children crying for their parents — images that have sparked fury, questions of morality, and concern from Republicans about a negative impact on their races in November’s midterm elections. Until Wednesday, the president, Homeland Security Secretary Kirstjen Nielsen, and other officials had repeatedly argued the only way to end the practice was for Congress to pass new legislation, while Democrats said Trump could do it with his signature alone. That’s just what he did. ‘‘We’re going to have strong, very strong borders, but we’re going to keep the families together,’’ said Trump who added that he didn’t like the ‘‘sight’’ or ‘‘feeling’’ of children separated from their parents. 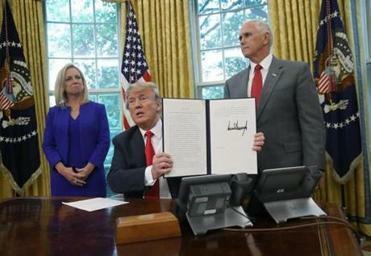 President Trump signed the executive order after intense criticism of the controversial practice of separating families. Read: Abraham: Where does the fault lie? The order does not end the ‘‘zero-tolerance’’ policy that criminally prosecutes all adults caught crossing the border illegally. It would keep families together while they are in custody, expedite their cases and ask the Department of Defense to help house them. But under a previous class-action settlement that set policies for the treatment and release of minors caught at the border, families can only be detained for 20 days. A senior Justice Department official said that hasn’t changed. ‘‘This is a stopgap measure,’’ said Gene Hamilton, counsel to the attorney general. Justice lawyers were planning to file a challenge to the agreement, known as the Flores settlement, asking that a judge allow for the detention of families until criminal and removal proceedings are completed. Health and Human Services Secretary Alex Azar said his department will start reuniting detained immigrant children with their parents — but he’s making no specific commitment on how quickly that can be accomplished. The ‘‘zero tolerance’’ policy put into place last month moves adults to the custody of the U.S. Marshals Service and sends many children to facilities run by the Department of Health and Human Services. The Flores settlement, named for a teenage girl who brought the case in the 1980s, requires the government to release children from custody and to their parents, adult relatives or other caretakers, in order of preference. If those options are exhausted, authorities must find the ‘‘least restrictive’’ setting for a child who arrived without parents.